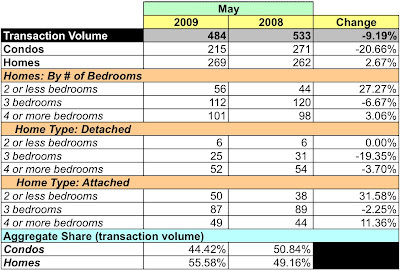 It's been almost a month since MRIS released its data for signed sales contracts for existing home and condos in the District during May 2009. Since June's data will be released in 5 days, here's an abbreviated synopsis of May's data. The condo market is on life support. Home prices are being propped up by the high end market; 27 homes - 10% of all home sales - sold for more than $1MM. If it weren't for those homes, I suspect average home prices would have been even lower. A huge drop in dollar volume, down more than 20%. 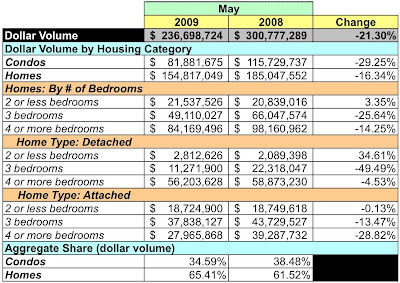 That of condos fell 29.25% YoY and dropped 16.34% for homes. Overall, 9.19% fewer units sold. 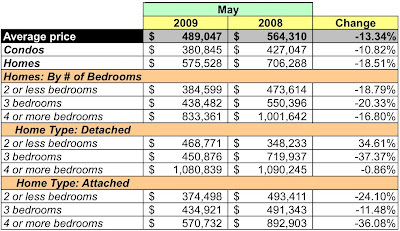 Condos fell 20.66% while homes rose 2.67%. Average prices fell 13.34%. Condo prices were 10.82% lower, homes fell 18.51%. Wow--that condo drop is big.